The SS-15ES and SS-15 Rigid Lockdown Wellhead System is a 15,000 psi system that features weight-set, metal-to-metal seals. The 18-3/4" Rigid Lockdown Wellhead incorporates all the field-proven features of Dril-Quip’s standard wellhead. The Rigid Lockdown Wellhead includes a locking mechanism that preloads the 18-3/4" wellhead to the conductor wellhead. This is to increase resistance to bending and increase the fatigue life. The rigid lockdown system can incorporate a pressure-balanced annulus shut-off valve that closes off the flow-by between the 20" casing after the 20" casing has been cemented into place. The SS-15 18-3/4" Standard Rigid Lockdown Wellhead is a nominal 27" O.D. The SS-15ES 18-3/4" Rigid Lockdown Wellhead has a nominal 30" O.D. The Mechanical Rigid Lockdown and Wellhead Running Tool is a drill pipe running tool that allows the running, installation and cementing of the 18-3/4" Rigid Lockdown Wellhead and casing in a single trip. 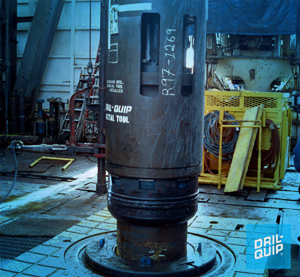 Contact your Dril-Quip representative for more information about the SS-15 and SS-15ES Subsea Wellhead Systems.